Supercharged Stim Free Fat Burner! Aspiring DemiGods and DemiGoddesses are continuously working to TR1UMPH over mediocrity to achieve the ultimate physique. A part of that process requires periods when you need to shift your focus to fat loss. The dreaded dieting phase where you reduce calories, usually in the form of carbs to get shredded. A lower calorie diet will reduce energy levels so you increase intake of stimulants. Sound familiar? There has to be a better way! It would be nice if there was a supplement that helped you lose weight without starving yourself to induce weight loss and subsequently depending on stimulants to remain functional. Thankfully, there is a supplement company that has the foresight to attempt such a feat. Olympus Labs is proud to present ASSASS1NATE, a combined stimulant free fat burner and glucose disposal agent (GDA) supplement. Olympus Labs considers the customer’s needs before profits and utilizes the best minds in the business to formulate supplements. The end result is innovative and effective products that are worth your hard earned money. ASSASS1NATE is no exception as it achieves everything you would expect in a fat burner plus additional benefits you never would think were possible. 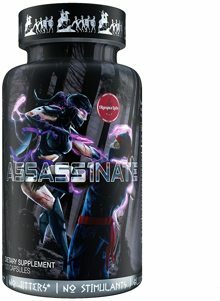 ASSASS1NATE allows you to CONQU3R dieting with the following two potent matrices. Sound too good to be true? Perhaps you need to raise your expectations on the quality of the supplements you purchase. Olympus Labs care about quality, from the selection of the ingredients in our supplements to the sourcing and testing of said ingredients. That is precisely why Olympus Labs supplements deliver Results! We are extremely confident ASSASS1NATE will continue that trend. A potent stimulant free fat burner and GDA in one. The supplement that you never even thought of, but need to have! Assassinate your fat SILENTLY like a Ninja! What: Korean Mistletoe Extract powered, performance enhancing anabolic amplifier! Who: Benefits men and women with achieving any goals.